Green, sprouty, salty and tasty. 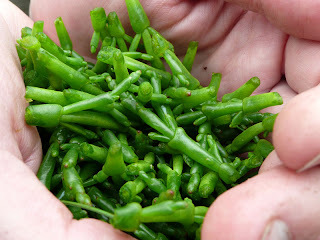 My dad was trying to get us to describe the taste of samphire; 'a bit like asparagus, but salty,' my brother ventured. I don't know how to describe it but the saltiness is, by far, the overriding flavour. The wee green shoots are popping up all over the salt-flats. They are tricky to spot at first; then you notice them contrasted against the background of the brown muddy areas, then, when you get your 'samphire eyes in', you begin to see them everywhere amongst the grass and sea-pinks. The sunny weather has made the prospect of lazy cooking even more than usually attractive. In this spirit of 'less time cooking means more time kicking back, watching the hills turn red, nice glass of wine in hand,' my wife threw together some salmon and samphire parcels. Oil on foil; samphire on foil; salmon fillets on samphire; cumin, pepper and butter on salmon; seal up the foil parcel and into the oven for 15 minutes. Ocean-tang-fastic. We'll be looking for the Sea Blite Suaeda maritima coming through next. More indescribable-other-than-in-terms-of-saltiness halophile treats for the summer months. Hurrah!